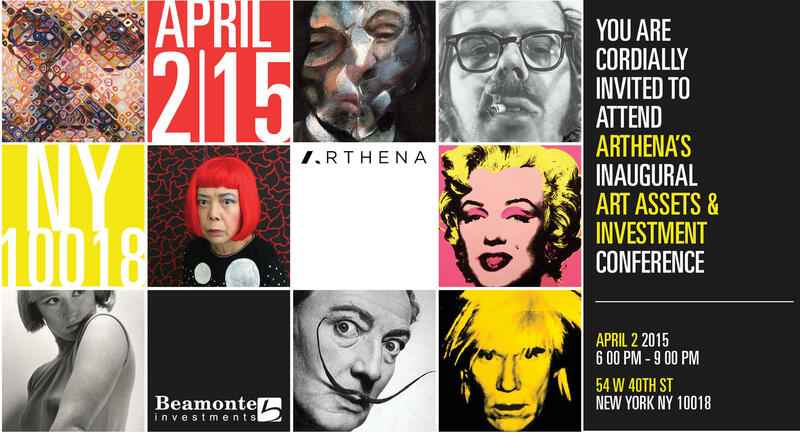 Arthena is the first equity crowdfunding platform to give individuals access to invest with leaders in the art world. We provide our clients access to the global art market while giving them unprecedented transparency and insight into their investments. Join us for our inaugural Art Assets & Investment Conference hosted alongside Beamonte Investments. The conference will feature invaluable insights from leaders in the fields of art, finance, and technology. We will discuss the latest international art market trends, how to value art, and the importance of art as a both a financial investment and an investment of passion. Adrien Meyer is the International Director of Impressionist & Modern Art and auctioneer at Christie's New York where he develops Impressionist and Modern Art Private Sales for the Americas. He joined the New York team in 2010. In 2009, he was granted a Commissaire-Priseur license by the French Ministry of Justice allowing him to conduct auctions in Paris, in addition to London and New York. In April 2013, Mr. Meyer was unanimously elected as Chairman of the Board of Trustees of FACE (French American Cultural Exchange). Mr. Meyer joined Christie's Paris in 2004 to run the European Furniture & Decorative Arts department. In this role, he was responsible for handling the most prestigious sales of that period, capturing a dominant position in this market. His team notably achieved the 4.1 million euros world record price for a Louis XIV commode in December 2008. Adrien began his career at Sotheby's New York and graduated from the Ecole du Louvre in Paris where he specialized in Contemporary Art. James founded and operates Orion Analytical. Orion investigates the authenticity of cultural property with state of the art technology. Over four decades, James has developed a unique and peerless skill set as a scientist, art conservator, classical painter, and teacher. He has undertaken more than 1,700 investigations for discerning clients on five continents. James taught at the Getty, Smithsonian, and FBI Counter-terrorism and Forensic Science Research Unit, and now holds academic appointments at New York University and Williams College; he also lectures at Columbia Law School, Christie’s Education, and Sotheby’s Institute of Art. James has conducted art fraud investigations for the FBI for twenty years, and is an esteemed expert in criminal investigations and legal proceedings in the United States and abroad. Led by Javier Lumbreras, Artemundi Group (AG) has offices in the Europe, China, Latin America and the USA. With a deep understanding of the behavior of art as an alternative asset, AG has successfully invested over half billion in the art market over the past twenty years by using accumulated quantitative and qualitative methods, economies of scale, global market arbitrage combined with the ability to identify, interpret and capitalize on specific art transaction opportunities. Javier Lumbreras has long played a pivotal role in the international art market. He has served as a consultant to selected private collectors; as a guest lecturer at museums, universities, banks and to leading media groups; and as a trustee to international art institutions. He currently serves as chairman of the board at the Art Fund Association. Mr. Lumbreras is an expert and a frequent speaker in matters pertaining to art collecting at large, art as an asset class including portfolio management and patrimonial estate planning. He is considered a pioneer in the field of art investment funds worldwide. He is a determined art collector. With five generations in the blood he founded The Adrastus Collection a family Trust initiative with institutional aims. Mr. Lumbreras has been quoted by Forbes, Financial Times, CNN, Reuters, MSN, Bloomberg, BusinessWeek, CNBC, New York Times, Art Daily, Skates, Art Tactic, etc. He is the author of the book The Art of Collecting Art which is now published in a second edition. Joseph Jacobs is an art historian who curated his first major museum exhibition—on Jacques Callot, the great 17th-century French printmaker—in 1970, and has been in a museum curator and director and in the art field in general for over 45 years. He was Curator of American Art at the Newark Museum (1991-2003), heading up one of the world’s greatest collections of American Art. From 1989 to 1991, he was Director of the Oklahoma City Art Museum, and from 1985 to 1989, he was Curator of Modern Art at the John & Mable Ringling Museum of Art, located in Sarasota, Florida, and the largest museum in the Southeast. Here, his contemporary art exhibitions were regularly reviewed in the major art and fashion magazines. Previously, he was Director of the Museum at Bucknell University, from 1981-1985, where he showed such emerging artists as Jeff Koons, Cindy Sherman, Louise Lawler, Keith Haring, Elizabeth Murray, Kenny Scharf, and Haim Steinbach as well as the very out of favor Andy Warhol, who had committed to doing a one-man retrospective with Mr. Jacobs at the Ringling Museum just prior to his death. Mr. Jacobs has written numerous books and exhibition catalogues. Best known is Janson’s History of Art, The Western Tradition, which he co-authored, writing the section “The Modern World” (over a third of the book) for the 7th and 8th editions. This book is probably the single most famous art publication in the world, and it was a front page article (with lengthy quotes by Mr. Jacobs) in The New York Times when it was published. Mr. Jacobs has written studies on photography (This Is Not a Photograph, 25 Years of Large-Scale Photography) and on folk, self-taught art, and outsider art (A World of Their Own: Twentieth-Century American Folk Art). One of the world’s leading experts on modern and contemporary art, he is now preparing a book on art since 1950, which is tentatively titled Art Since 1950, The Path to Postmodernism. He has written for many major art magazines, including Art in America, Art & Antiques, and Arts. Clear your calendar - It's going down! Sullivan kicks off on February 1st, and you're invited to take part in the festivities. Splash HQ (122 W 26th St) is our meeting spot for a night of fun and excitement. Come one, come all, bring a guest, and hang loose. This is going to be epic! Adam Kopec is a host of exceptional ability. Studies show that a vast majority of guests attending events by Adam have been known to leave more elated than visitors to Santa's Workshop, The Lost of Continent of Atlantis, and the Fountain of Youth.